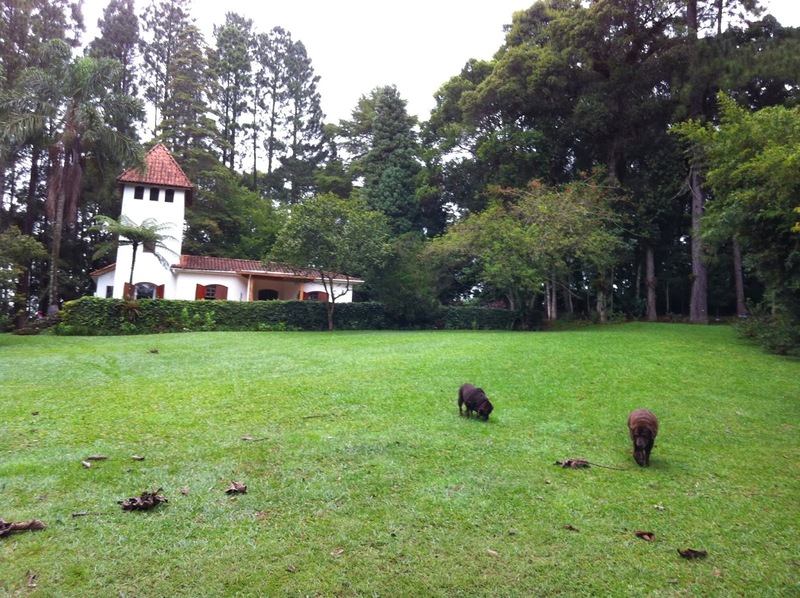 We came back from our rented country house (nicknamed the "Alemão" or German house) on Monday morning and since then I've been trying to track down information on all the animals and mini-beasts that we saw during our four-day visit. It really was a wild kingdom. On the first evening of our arrival, we were greeted by the calling of monkeys in the pine trees. They were enormous golden-red monkeys which were leaping from tree to tree. 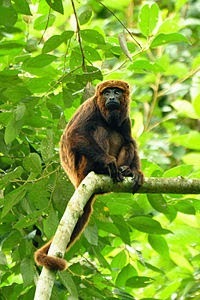 It seems likely that these are "bugio" or howler monkeys. We did not see this type of monkey again, but we heard them every morning calling to each other. I have not been able to identify the monkeys we saw on Sunday morning--they were small and black and extremely acrobatic. They ran up and down branches, one was even carrying a tiny baby on her back. It is possible that these were some kind of capuchin or Atlantic Titi, but I just don't know enough. 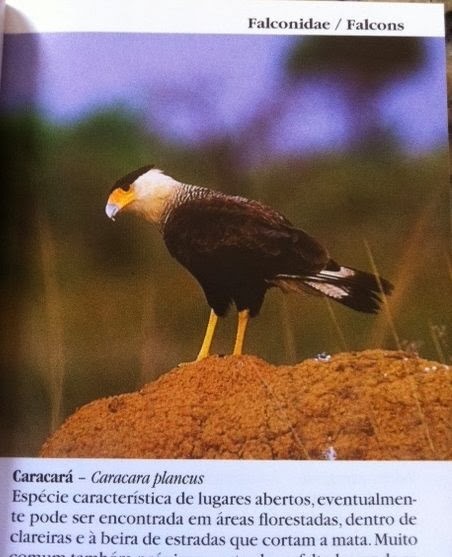 We also saw a pair of caracarás, a gorgeous type of falcon that is so huge that I misidentified it at first as a type of eagle. I found this one in my bird book "Aves da Grande São Paulo" written by Pedro Develey. I have a couple of photos of these guys which I took as we drove down the dirt road but they are missing in action at the moment (the photos, not the birds). The two at the Alemão have been there for about a year--they are juveniles. Once in a while their enormous mom flies in but I think they are mostly on their own now. My mom saw a parrot on a solo hike, one that seems to be called "the scaly-headed parrot" (it should always market itself by its Brazilian name of maitaca--"scaly-headed" indeed. That's just mean). Monk parakeets also flew across the sky several times. 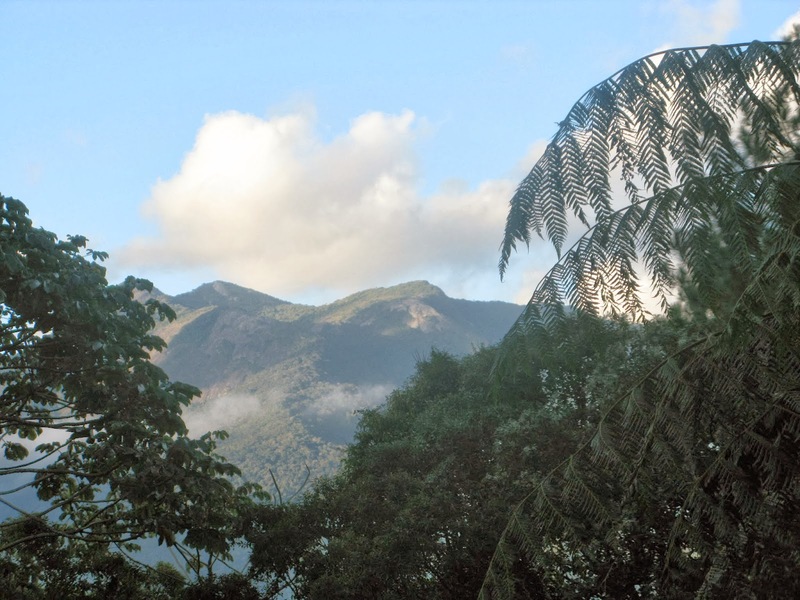 We have yet to see the big boys of the mountain range: cougars (onça-parda), maned wolves (lobo guará) or ocelots (jaguatirica) but all have been seen by the workers on the ranch, or by other renters. Or so the stories go. 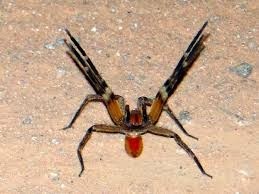 On the mini-beast side, we got an invitation to a fight from an armadeira (Brazilian wandering or armed) spider. It had its front arms waving in the air practically screaming "come on, let's fight!" so I felt a little bad just squishing it with my shoe. It is highly aggressive and highly poisonous though so I got over my guilt. We had also seen a huge tarantula the visit before--it was sitting in the middle of the road and my husband did not want to run over it (whether it was to avoid the squishy juice on the tire or to prevent it from catching a ride back to São Paulo, I just don't know. AGGGGHHHH!! Tarantula in the road! Ugh. I hate spiders. BH made me chase it off the road with a large stick and then scared the beejees out of me by honking the car horn when I was in a precarious stretch over the spider. Our divorce will soon be final--you do not try to freak me out with spiders. I still haven't spoken to my brother since going to the movie Arachnophobia with him (why I was suckered into this, I really have no clue) twenty years ago--at a slow moment, he tickled my arm lightly and I screamed the movie house down. Anyway, you've heard about the firefly 747 from earlier this week. The usual tadpoles and water skimmers were around on the lower lake, yellow butterflies, blue morphos, and my friends the mosquitos. I call them friends at the fazenda because they are so slow-moving that I can welcome them to my clapped hands without a problem. No snakes this time but my kids caught a toad. Apparently a poisonous one but my kids haven't turned any weird colors or lost arms so I guess it worked out okay in the end. The view from the Alemao. Morro Selado.No monkeys in sight.